I hoped that rerouting my trip to Washington DC through Philadelphia to make a single stop was going to be worth the inconvenience. Having heard and read about the much heralded Barnes Museum and its unique beginnings, I decided to investigate for myself. Upon my arrival, as I approached the museum I was struck by the clean lines of the building housing the collection, the beautifully maintained grounds and large infinity pond. A good beginning. Having read a great deal about this famous collection and its history I was eager to see for myself. The amazing, self motivated Dr. Albert C. Barnes, born in a working class neighborhood of Philadelphia in 1872, developed an interest in art. His fortune came from the invention of Argyrol and with it his lifestyle changed dramatically. He built a home in Merion, one of the most exclusive neighborhoods of Philadelphia and with his own innate appreciation of fine art and with the assistance of his friend, artist William Glackens, Barnes acquired an outstanding collection of Impressionist, Post-Impressionist and early Modern paintings; medieval manuscripts and sculptures; Old Master paintings; Native American fine crafts; Early American furniture and decorative art; and ancient Egyptian, Greek and Roman arts. He also collected and became an influential collector of African sculpture. As time went on, he was inspired by a post graduate seminar at Columbia University taught by John Dewey. Barnes soon purchased a 12-acre arboretum in Merion and established the Barnes Foundation, an educational institution dedicated to promoting the appreciation of fine art and horticulture while sharing his interest with his employees through seminars. Barnes intended the audience for the foundation to include factory and shop workers, poor and disenfranchised people, African-Americans and young artists. 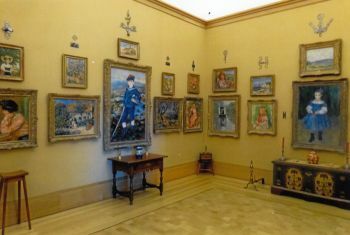 He believed that those exposed to his collection would not only learn about art but would improve their critical thinking and ability to learn and succeed in the world. In its new conveniently accessible home in downtown Philadelphia, the Barnes Collection, organized into what Dr. Barnes referred to as ensembles, has been arranged in an unconventional way, one of the hallmarks of this exceptional assemblage of masterpieces. Docent led tours explaining the ensembles which are not always apparent to the untrained eye add to the experience of these exceptional displays. Among the major holdings, the Barnes includes 181 works by Renoir, 69 works by Cezanne, 59 by Matisse, 46 by Picasso, 7 by van Gogh, 21 by Soutine with an extensive collection of 20th century American paintings, dozens of Old Masters, African sculptures, Native American jewelry and a sundry collection of wrought iron objects. Special and diverse installations and exhibitions continue throughout the year so there is always something new to see. 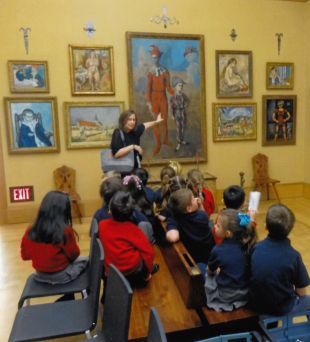 During my visit, I happened across a group of first graders surprisingly intent on the painting before them, Picasso’s Acrobat and Young Harlequin. A docent stood beside the great masterpiece engaging the children in a discussion of what they were looking at. A fine way to begin to teach critical thinking and appreciation of the wonderful world of art just as Barnes had predicted. Due to time constraints, I was unable to visit the Arboretum, the original home to the Barnes collection in Merion. However, when I come for a return visit, this will definitely be included on my itinerary. The 12 acres showcase a collection of more than 3,000 unusual species of woody plants, state champion trees, hundreds of flowers and medicinal plants. In accordance with Dr. Barnes wish to promote education, the foundation offers a three year integrated horticulture certificate. The good doctor insisted that the museum and gardens be available to everyone regardless of race, creed, citizenship, disability or any other restriction and so it remains. 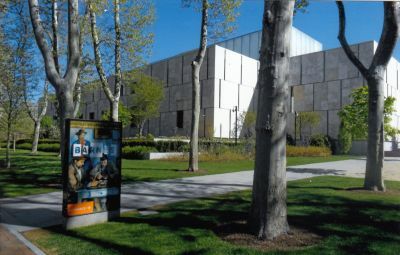 In addition to touring the museum and arboretum, the Barnes Foundation also offers art workshops, nightlife and performances and lectures. My only regret was lack of time to further explore this very special gift which the magnanimous Dr.Albert Barnes left for all to enjoy.